Before looking at the newer truMedic TM-1000PRO, I wondered how the device would compare to the PL-009, (one of the first TENS units I reviewed). I always believed that with a few tweaks and design improvements, that earlier truMedic machine could have been greatly improved. Don’t get me wrong, the PL-009 is a massively popular device – and for good reason. But I do feel there were aspects that should have been designed better. 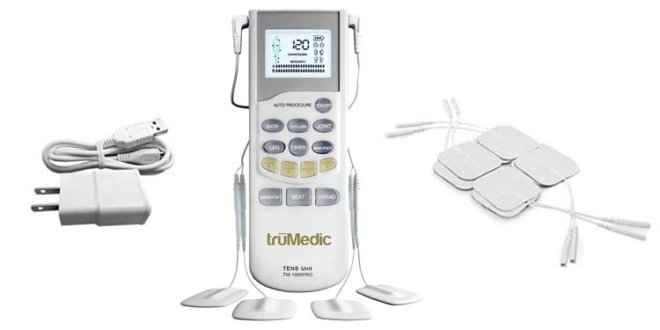 In this truMedic TM-1000PRO review, I’m going to guide you through their latest TENS machine and see how it compares to its predecessor. 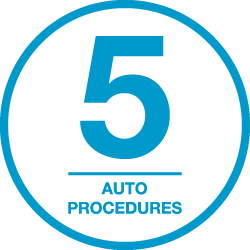 These procedures are pre-programmed and designed to be most effective on the particular area they’re named after. That isn’t to say you can’t use them on other regions of the body. They’re very much interchangeable and it’s up to you to try them out and see which you respond best to. Automatic programs like these make it easy for the novice to get started with TENS therapy at home. Compare this to something like TENS 7000 (read my review here) and you’re going to find that it requires much less user input to vary the therapy. This type of device with automatic programs, is likely to be the easiest and most straightforward option. You may find that you prefer using Massage, Beat or Knead on your back, rather than the actual Auto Procedure named “Back”. Again, it’s going to be up to you to experiment and see which work best for you, and your particular pain. 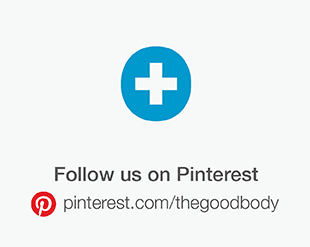 All people, bodies, and pains are different – there’s no one size fits all solution. 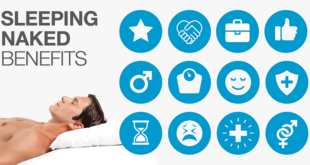 Like most things, you can get used to one type of treatment. Having the Massage, Bead, and Kneat functions – as well as the Auto Procedures – gives you the means to vary your sessions, nicely. One major upgrade from truMedic’s previous model is the timer. With the PL-009 there was no way to set a specific time for your session, it had to be the standard 15 minutes. The problem with that is it shuts off after 15 minutes and you have to turn it back on and start again, if you want a longer session. It’s not the end of the world – but it is an inconvenience. 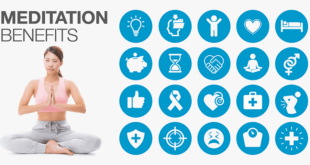 Let’s you choose a: 20, 30, 40, 50, 60 or 120 minute session. 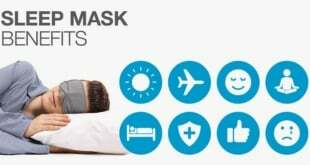 So when you take into account the programs, functions, and timer, it’s fair to say that TM-1000PRO offers a great deal of flexibility – and versatility – for at home TENS therapy. You can use the machine with either two or four pads at a time (there are two per channel). Unfortunately, there is no way to add more pads to the setup. If you want to be able to use more pads, there are some devices on this page that have four channels, meaning you can use up to eight pads. Where might eight pads be useful? 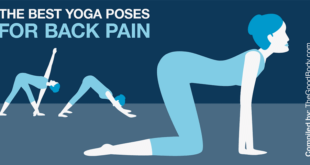 If you have back pain that isn’t just localized in a small region. With eight pads you can run four down each side and cover a large area. Not everybody is going to need so many pads but certain individuals may find them extremely beneficial. 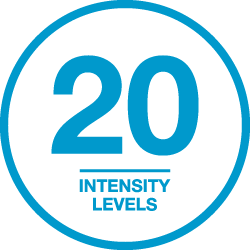 There are 20 intensity levels to choose from, double as many as the PL-009. Don’t confuse a high number of intensity levels with how powerful the device is. Just because it has 20 levels, it doesn’t make it twice as powerful as a machine with only 10. Is the jump between levels is less. For example, if you only had five levels to choose from you’d be very restricted, especially if three wasn’t strong enough for your pain – but four was too much. Another advantage is that you can move up through the levels during your treatment. You might want to start the session off at a low level and increase it as you progress. So to a certain extent: the more levels you have at your disposal, the better. Myself though, I wouldn’t choose one device over another purely because it has more levels than another. A device with 20 levels is going through the power range in increments of 5% at a time, whereas a machine with 25 is adjusted in increments of 4%. Both are going to give you an excellent amount of control over the power. *The above includes a handful of well-known TENS machines, as an example and is by no means an exhaustive list. To compare the specifications (including levels of intensity) of a larger number of devices you can use the tool on this page. With this machine you adjust the intensity by pressing the “Intensity +” and “Intensity -” buttons. If you want to change the level in one channel you press either: “Channel A” or “Channel B” immediately before the intensity controls. The channel buttons are (conveniently) located right next to the intensity ones. 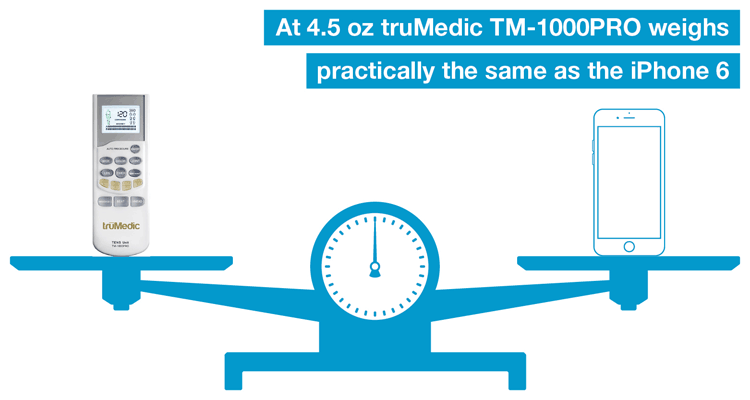 truMedic’s previous model was easy to use, and this new TM-1000PRO makes things even easier. What I especially like about the design of this unit is how truMedic has redesigned the intensity controls. On that model the intensity is adjusted by moving the dials on the outside of the device. The problem with that though is they’re highly sensitive and can be knocked by accident. Imagine the shock when you unexpectedly go from one of the lowest settings to the highest! Not pleasant. Thankfully, truMedic’s designers addressed this with the TM-1000PRO and decided to move the controls – from the side – onto the front. They went with buttons, instead of the dials. In general, I prefer buttons but I don’t have a problem with dials, when they’re done right. The examples being: TENS 7000 and TENS 3000, which both have protective covers over the dials and controls, to prevent any accidental contact and unwelcome adjustments. Another improvement brought to truMedic’s TM-1000PRO is the screen. The LCD display is now backlit, unlike its predecessor’s. This is handy. When I use a TENS machine I want to relax. I’ll often use it in the evening so I’ll want to see the display without having to switch lights on and alter the ambience. The screen isn’t enormous but it is a reasonable size and does the job. It is clear and easy to read and gives you all the information about your current settings, at a glance. You can see: the remaining time, intensity level, program and whether “Massage, Beat, or Knead” is selected, along with the remaining battery level. The built-in rechargeable lithium-ion battery is another welcome addition to the TM-1000PRO. You don’t need to have owned a TENS unit to understand how frustrating it can be when batteries run out. The last thing you want is a trip to the local store just so you can use your machine again. 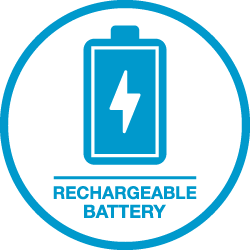 How it can be charged in a mains outlet or through a USB cable. The cable plugs into the A/C adapter for mains charging and can then be used by itself to charge through a computer or other USB charging outlet. 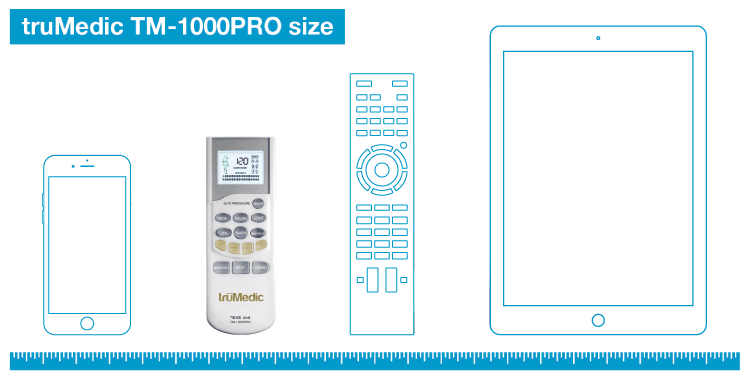 At 6 (h) x 1.8 (w) x 0.5 (d) inches truMedic’s TM-1000PRO isn’t the smallest device out there. It is however, considerably more compact than the PL-009 which measures 7.8 inches in height. It’s also smaller on the width and depth measurements than its predecessor, with that being 2.2 in wide and 0.9 deep. As far as weight goes, the unit is pretty light – 4.5 oz which is practically the same as the iPhone 6. If portability and compactness is your number one priority, you may like to take a look at some of these machines. Many of those devices are the size of an iPhone or smartphone and can be charged the same way as this machine (USB or mains). 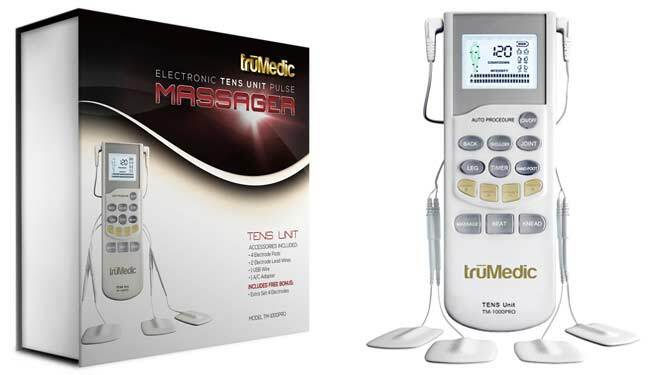 truMedic TM-1000PRO comes with your first set of pads (4 in total), lead wires, USB wire, A/C adapter, instruction manual, and also includes a “bonus” 2nd set of pads (4 more), handy carry pouch, and a Yoga Video Series. 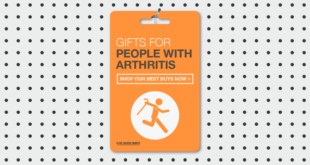 So you’ve got everything you require to get started immediately – or as soon as you need some pain relief! Well, almost immediately… simply, charge the unit up when it arrives and then you’ll be good to go. Always advise people not to pay too much attention to the electrodes that come with the TENS unit. The reason being: that there are literally hundreds of different replacements you can buy. Fortunately, TM-1000PRO takes a standard pin type electrode (the most common fit). Unlike this machine, many others ship with cheaper, inferior quality pads. I see many comments and consumer reviews about how electrodes that come in the box aren’t very good. Of basing your purchase choice on the pads that are supplied with the unit. As long as the device takes a standard fit electrode you can buy some replacements for a few dollars. There’s not much I don’t like about truMedic’s TM-1000PRO. 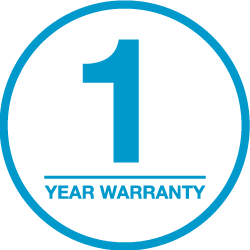 I’m not a great fan of how you have to register to get the one-year warranty. I just think with a machine of this quality and price point, it should come with at least a year as standard. When you purchase the device it ships with a 90-day warranty (which covers parts and labor). You receive instructions with it on how to register online and upgrade it to a year’s cover. I’d rather not have to do this – and personally, when I’m spending this sort of money, feel like I shouldn’t have to. 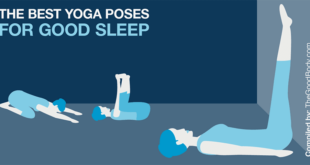 It only takes a few minutes so it’s not worth getting too wound up about! I guess if this is one of the biggest gripes I have with the product, they must be doing something right. When you compare the warranty to that of other machines, it’s fairly standard. Most TENS units come with a single year’s cover, although you will find some with more. 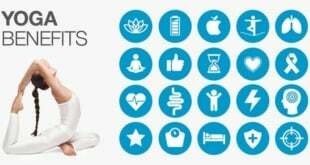 HealthmateForever’s units (see my article about them here) come with a limited lifetime warranty (if they’re purchased in the USA or Canada). TM-1000PRO is a reasonably new device, it came onto the market in late 2014. As I update this (on 23 November, 2015), the machine had been reviewed over 150 times on Amazon, and had a star rating of 4.2. That’s fairly is impressive. 65% of consumers had rated it at 5 stars. If you take a look on Amazon at TENS units, you’ll see that sort of rating compares well. It seems to retail for around $140, despite a MSRP of $299.97. At this sort of cost, the unit is in a much higher price bracket than truMedic’s entry level device, the PL-009. However, it is a far superior machine. Here’s the link to its Amazon listing, where you can check for an up-to-date price. Listened to customer feedback and incorporated the most-requested features. I’d have to say that they’ve done a good job with this, and wholeheartedly agree with that statement. While their PL-009 is a very highly-rated (and affordable) TENS unit, it does have some design flaws. 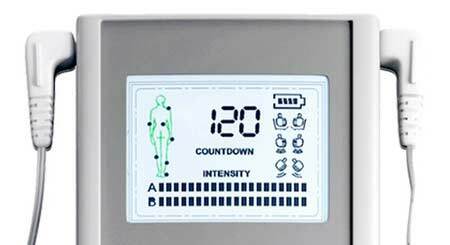 In designing this device, they appear to have addressed those flaws – and in doing so, created a simple-to-use feature-packed TENS unit. Anybody who has read my review of Omron’s Pain Relief Pro, will recall that I said something similar there. Omron recognized the need and made a number of improvements on that machine’s predecessor (the PM3030). 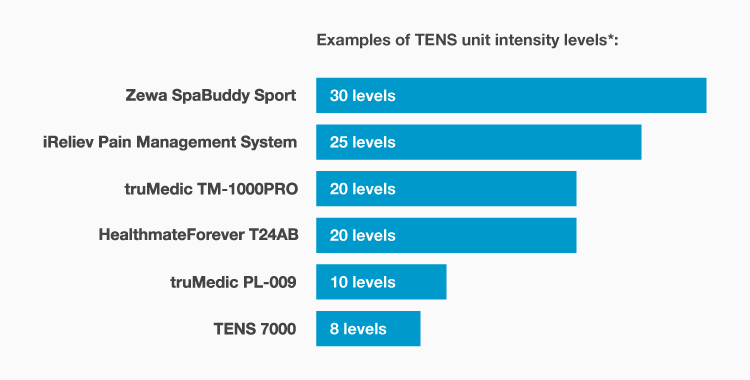 What this suggests is that TENS unit manufacturers are seriously having to up their game. So many impressive new devices are coming onto the market, it’s imperative for them to keep up with the rest of the field. 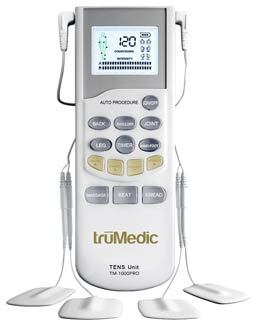 With the TM-1000PRO, truMedic now has a TENS unit capable of competing at the higher end of the market. This compliments the PL-009 nicely, which is one of the most popular budget devices around. I really like what they’ve done with this machine – and believe it has taken everything that’s good about the PL-009 – but has eradicated all of the not so good. 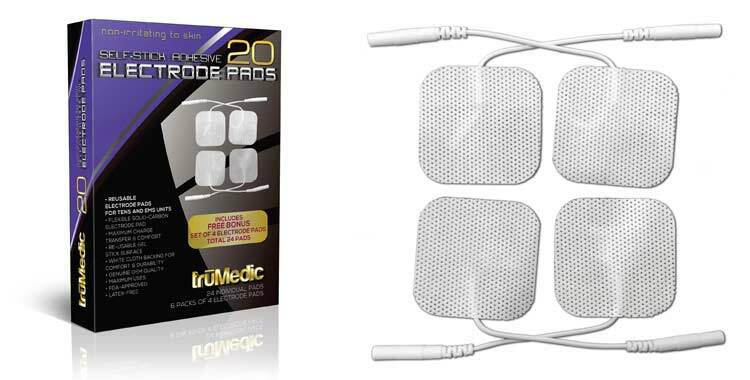 If you’re looking for a feature-rich rechargeable TENS machine that’s a doddle to use, the truMedic TM-1000PRO has to be a serious contender. Previous truMedic PL-009 Review: Affordable – But A Good Investment? Next TENS 7000 Review: Is This The Best Value Device Around?